A shot of the dining area taken from the living room. 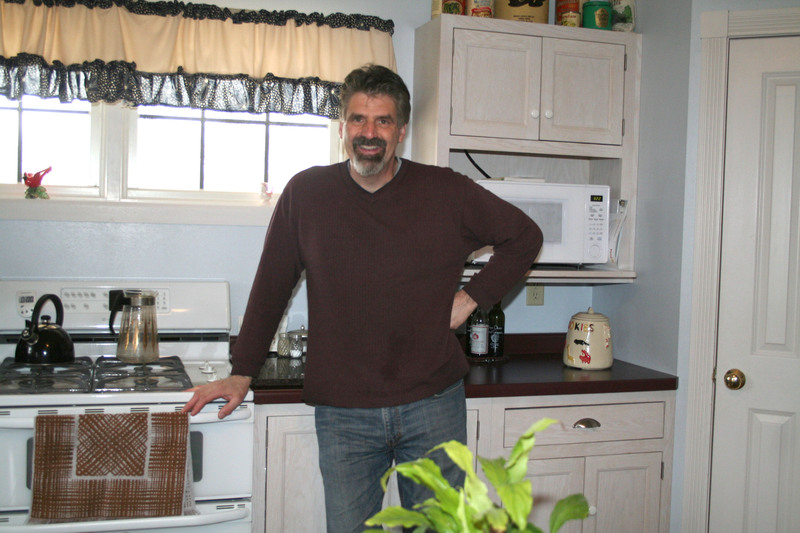 Dave shows off Aunt Bee’s kitchen. 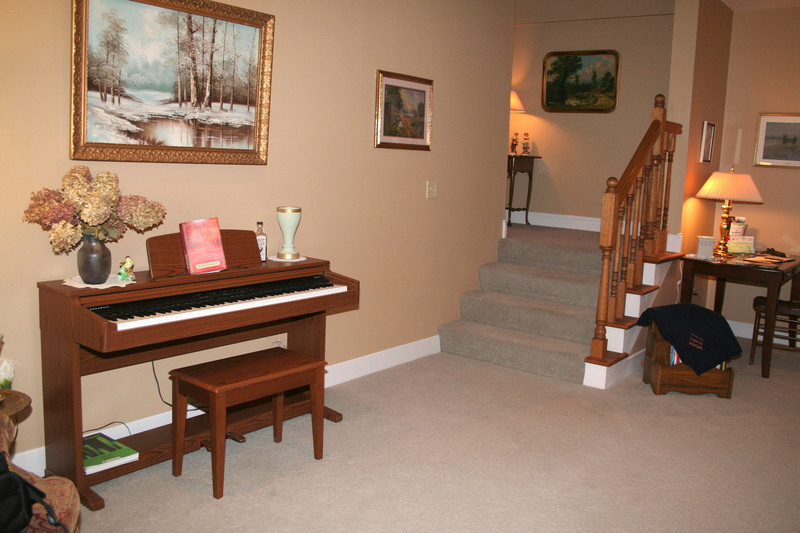 The stairs lead to three bedrooms on the second floor. 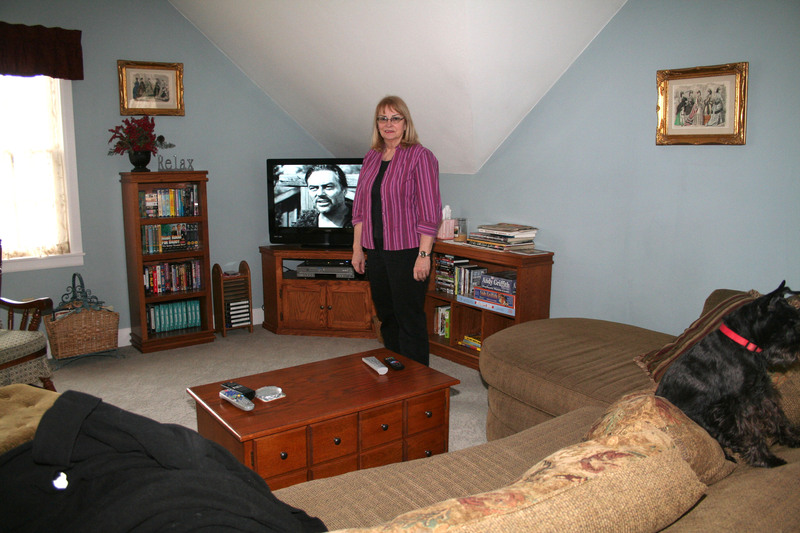 The television room on the second floor. 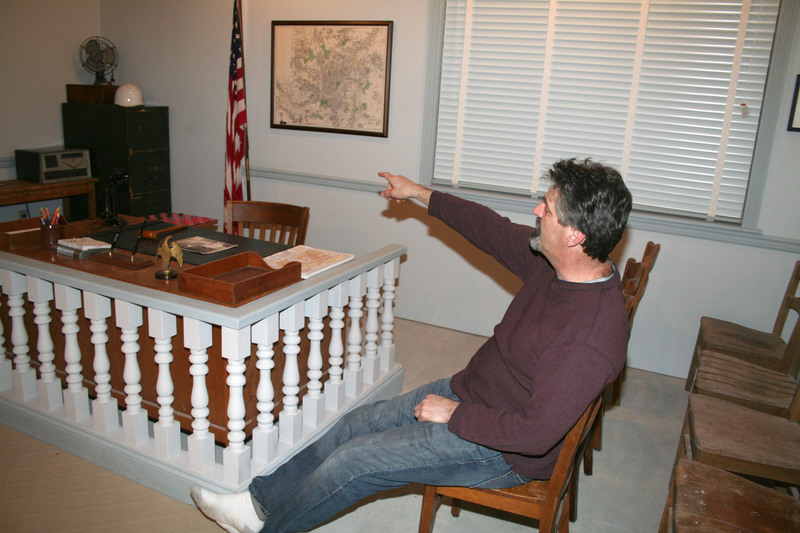 Dave points to some of the artifacts in the Mayberry Courthouse. The sheriff’s office looks just the way you remember it. The only thing missing from the jail is Otis Campbell. 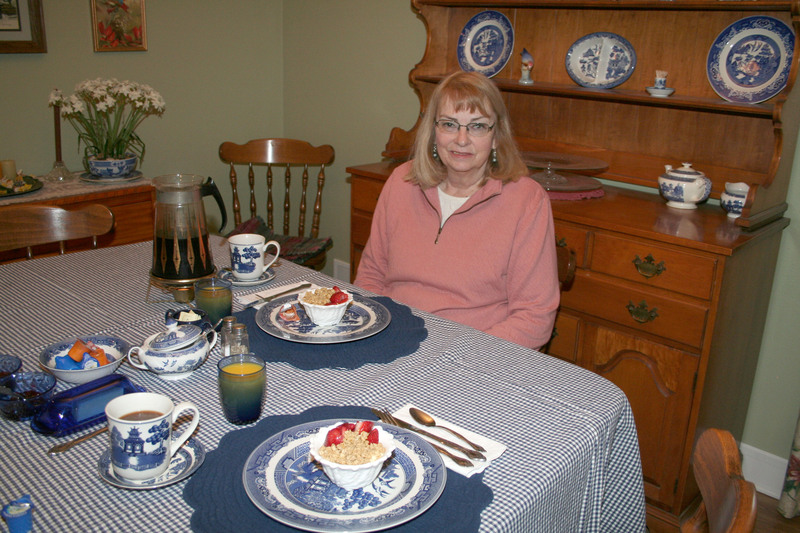 Breakfast was served on china just like Aunt Bee’s. A scrambled egg dish was delicious. When you pull up in front of a nearly exact replica of Sheriff Andy Taylor’s house, you feel like you’re in the sleepy town of Mayberry, N.C., and you’ve stepped back in time to a simpler way of life. Look at the wicker furniture on the inviting front porch of the Taylor house. You can easily visualize the cast of TV’s “The Andy Griffith Show,” which aired from 1960 to 1968, relaxing there on a warm, lazy Sunday afternoon. Andy, a widower, is strumming his guitar while Barney, his cousin and deputy, and his son Opie, listen. Andy’s Aunt Bee walks out of the house holding a tray of glasses and serves lemonade to everyone. But this isn’t Mayberry. This is western Wisconsin, and the house is the Taylor Home Inn Bed & Breakfast (taylorhomeinn.com), located 90 miles northeast of the Twin Cities. My wife Sherry and I stayed there March 26. Sorting through some paperwork recently, I had discovered an old newspaper article about it that I had clipped and saved. 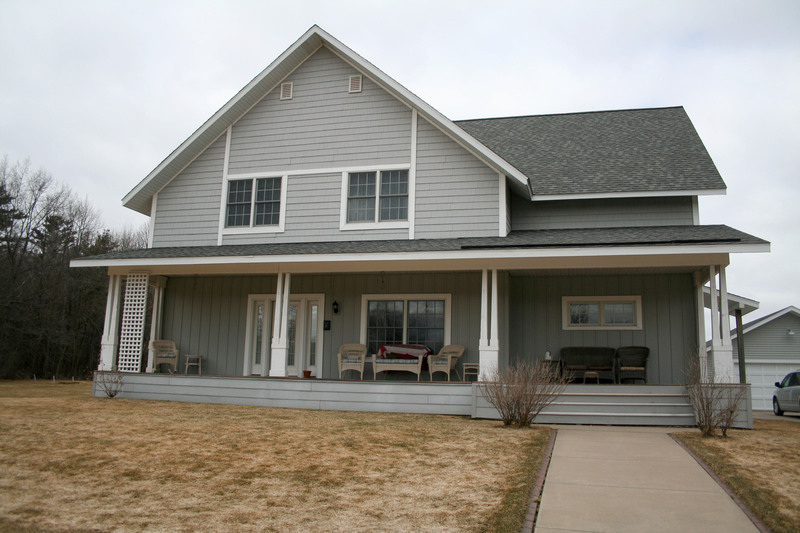 In 2003, Dave Scheuermann, the B&B’s owner and operator, built this faithful recreation of Andy’s house on six acres of land at 373 30th Ave., outside of the town of Clear Lake, population 1,052. Clear Lake is the hometown of the late Burleigh Grimes, a baseball hall of famer known for being the last player officially permitted to throw the spitball and the late Sen. Gaylord Nelson, the founder of Earth Day. Dave was just 1 year old when “The Andy Griffith Show” first went on the air. 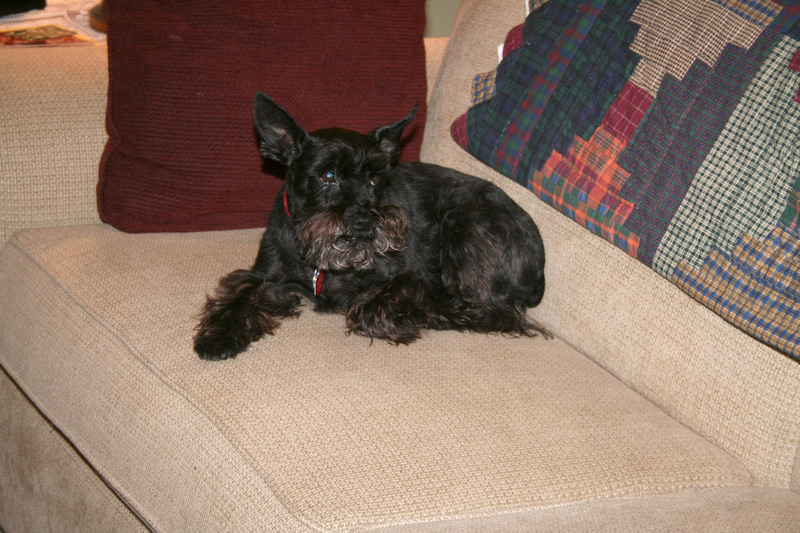 Despite that, he is a huge fan and probably knows more show trivia than anyone you’ll ever run across. It’s no wonder. To build his replica, he studied every one of the nearly 250 episodes to determine the layout of Andy’s house and how it was furnished. He decided on the 12-foot width of the living room’s stone fireplace, for example, by counting the number of strides the sheriff took as he walked in front of it, figuring 3 feet for each step. 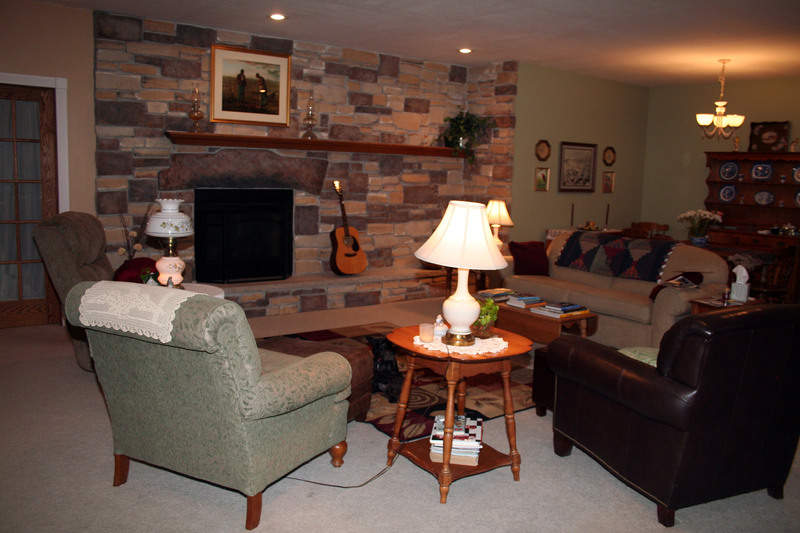 Then you’ll step into Andy’s living room, which looks exactly like it did on TV. It’s so familiar, you feel like you’re home. A black rotary dial phone sits on an end table near the fireplace. And leaning against the fireplace is an acoustic guitar. A pair of Barney’s handcuffs rest on a small table used for registering guests. 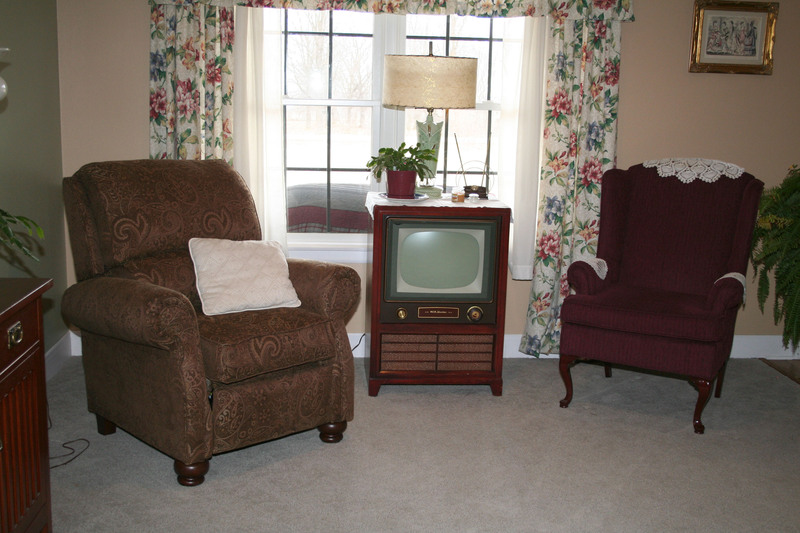 There’s a vintage RCA Victor black-and-white television. And on a piano near the stairs leading to the second level is a bottle of the “medicine” that “will fix any ailment” and made Aunt Bee loopy, Col. Harvey’s Indian Elixir. 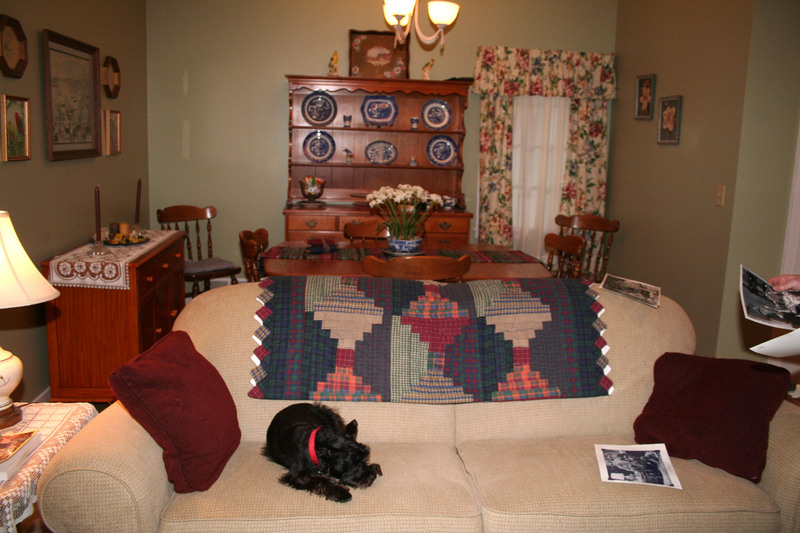 On one side of the living room is the dining area with its familiar hutch and a Grandma Moses painting that took Dave four years to find. Through an adjacent doorway is the kitchen where Aunt Bee prepared dinner and Barney stopped by for coffee. 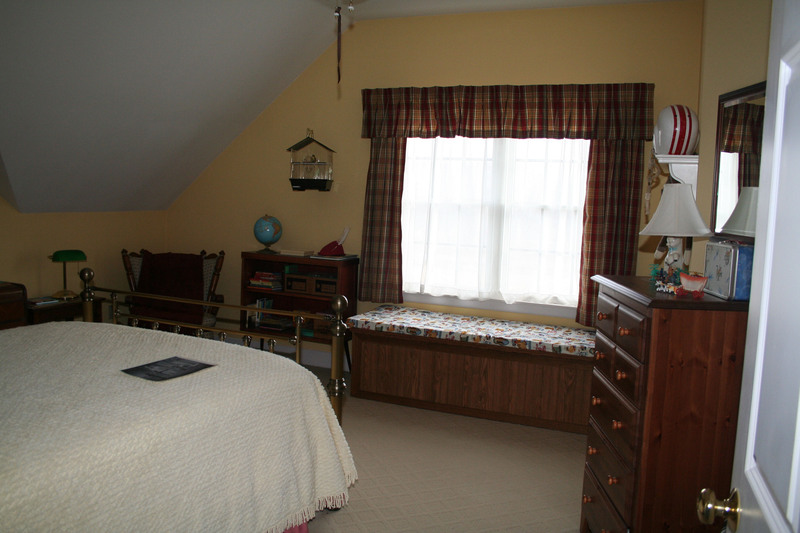 Upstairs are three bedrooms — Andy’s, Aunt Bee’s and Opie’s — from which visitors can choose. All include a private bathroom. We stayed in Andy’s room for our visit. 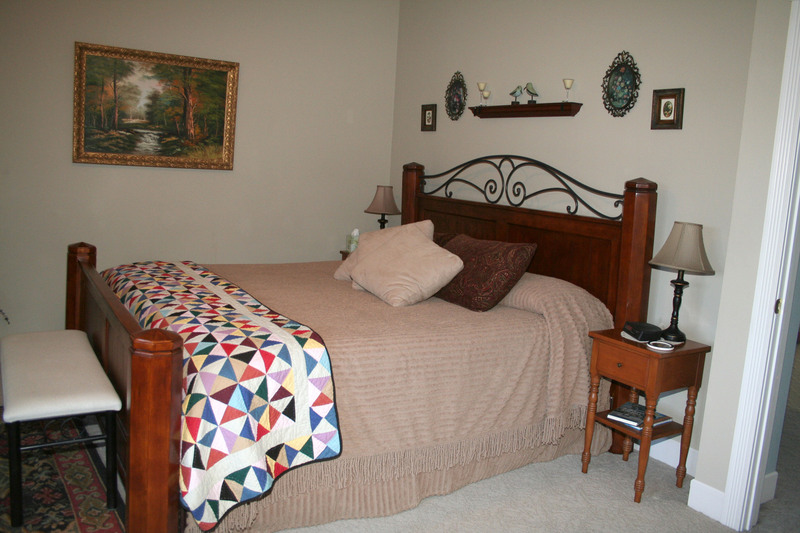 Also on the second floor is a comfortable television room with satellite TV, afghans or quilts for cuddling, movies and vintage television shows on DVD, a variety of games, a refrigerator, a microwave oven and complimentary water and popcorn. Dave even served us delicious homemade chocolate chip cookies there during our stay. 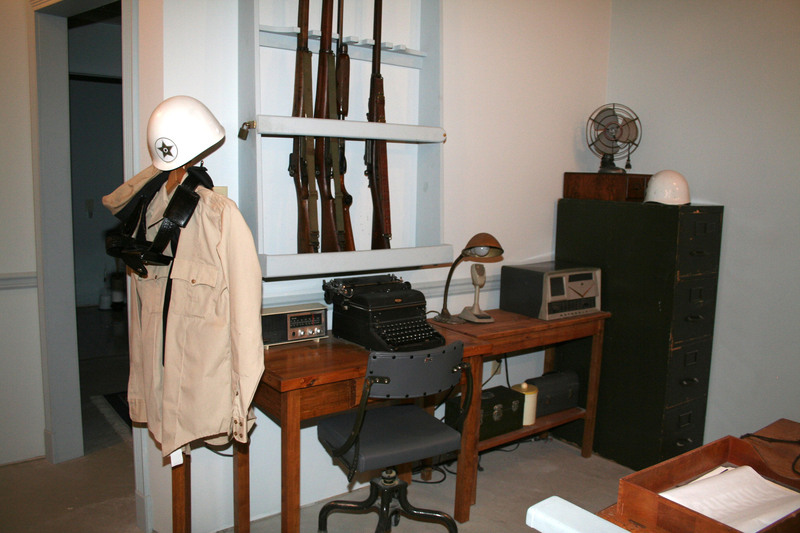 One of the highlights for me in the Taylor house was the basement, where a replica of the Mayberry Courthouse has been constructed. 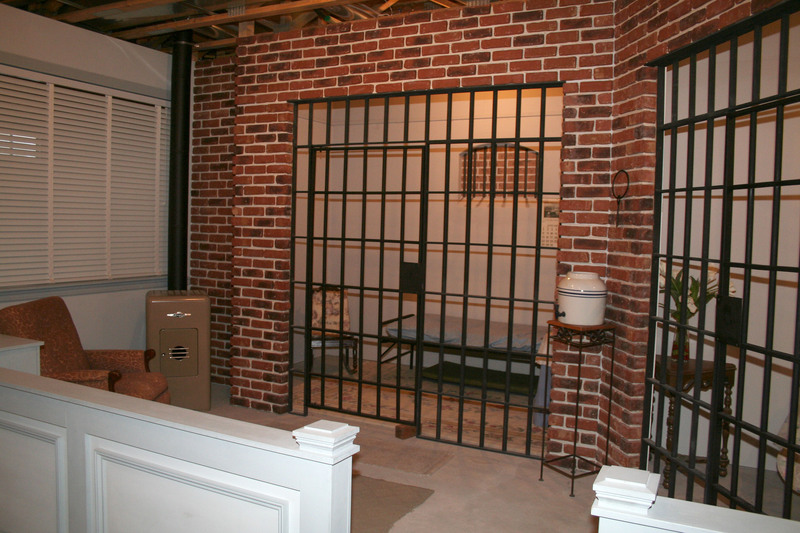 It includes the office of the sheriff and justice of the peace, two jail cells and Barney’s simple sleeping room. A replica of Wally’s Filling Station sits outside in back along with a putting green for guests who are golfers and want to practice. Some woods are adjacent to the house, and it is surrounded by hay fields that provide cover for deer, foxes and other animals. Dave said he has even seen a bear from time to time. Future plans include conversion of a 1961 Ford that Dave owns into a Mayberry squad car and construction of Floyd’s Barbershop next to the courthouse in the basement. The proprietor has food service experience, and that was obvious at breakfast time. He started us off with coffee, orange juice and a goblet of sweet yogurt topped with granola and fresh strawberries. 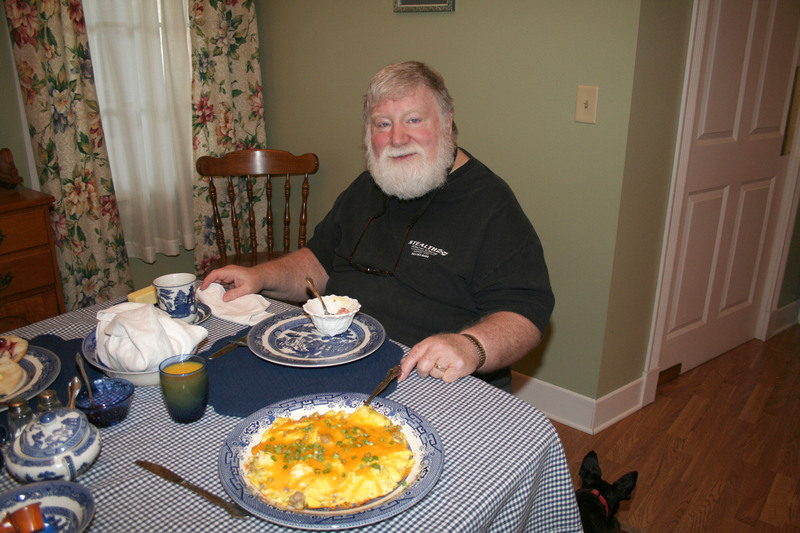 He followed that with some warm rolls and preserves and a scrambled egg dish that included sausage and was topped with chopped green onions and melted cheese. Everything was delicious, and the food was served on Blue Willow plates just like Aunt Bee’s. 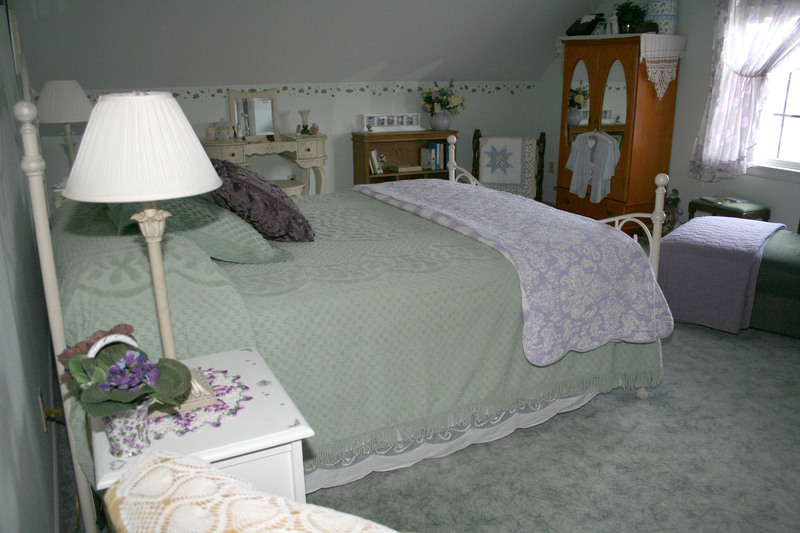 Rates at the Taylor Home Inn Bed & Breakfast are $128 per bedroom per night. Dave doesn’t take credit cards, so payment must be made by cash or check. If you want to stay there, make a reservation by phone at (715) 263-ANDY (2639) or by email at Reservations@TaylorHomeInn.com. Copyright 2015 by Phil Roberts, Creative Enterprises. I was raised in N.C. and have watched the show my whole life. A couple years ago, my husband brought home an old table. A friend was throwing it away. I thought it was unique, so I kept it and used it as a night stand, still do. Today, while watching a marathon, I noticed that the old table I like so much and the table at the top of the stairs of the “Taylor” home, are the same.